Loh, J. T., Gunawan, M. and Su, I. (2016). Ear Inflammation and Whole-mount Ear Staining. Bio-protocol 6(20): e1967. DOI: 10.21769/BioProtoc.1967. The recruitment of circulating neutrophils from the bloodstream to the site of inflammation represents one of the earliest events during an innate immune response. During this response, neutrophils tether and roll along the vessel walls before transmigrating across the endothelium into the interstitial space to exert their functions. Here, we describe a protocol for the staining of intravascular and tissue-localized neutrophils following contact sensitization of the skin with croton oil. Visualization of the neutrophilic distribution in skin provides for a better interpretation of the local immune response. Characterisation of neutrophil distribution within the skin following inflammation represents an important avenue for the understanding of their specialized functions. Even though the recruitment of neutrophils to the inflamed skin has been widely characterized by flow cytometry (Hampton et al., 2015; Stock et al., 2014), such technique provides limited insight on the intravascular versus interstitial localization of neutrophils. Recirculating and tissue-localized neutrophils exhibit different phenotypes and functions, which necessitates their discrimination to identify key players of the local immune response. With the development of intravital microscopy (IVM), the direct visualization of fluorescently tagged immune cells in vivo is made possible. However, due to the high cost of IVM, the accessibility of this powerful imaging tool to researchers is limited. Here, we present an alternative protocol for the high resolution static imaging of neutrophils in skin by making use of cost-effective reagents and commonly available confocal laser-scanning microscopy. Apply 20 μl of freshly prepared 1% croton oil (in acetone) on the dorsal side of each ear with a pipette. 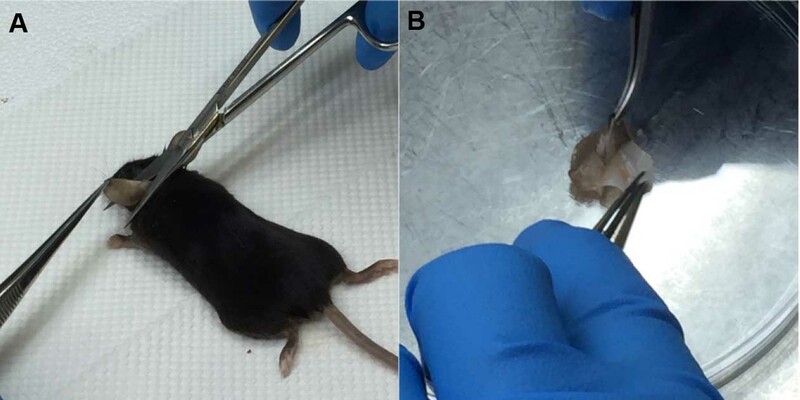 Sacrifice mice after 3 h. Remove hair on dorsal side of ear with Veet using a cotton swab (Figure 1A). Wash away Veet with PBS using a cotton swab after 3 min. Repeat until Veet is completely removed (Figure 1B). Figure 1. 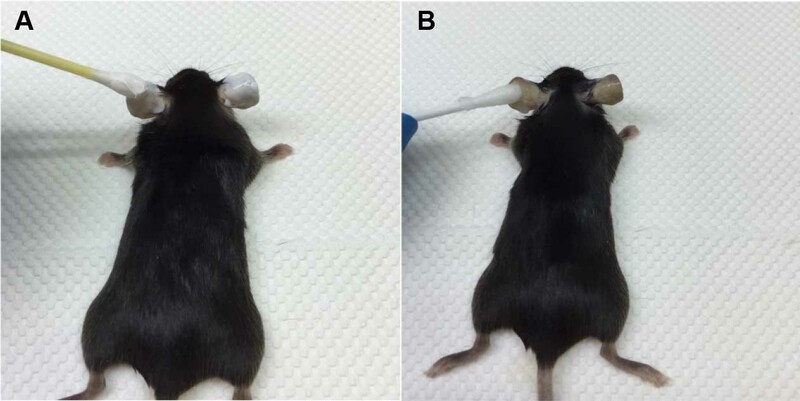 Removal of hair from mouse ear. A. Application of Veet on the dorsal side of ear using a cotton swab. B. After 3 min, Veet is completely removed with PBS using a cotton swab. Harvest ear. Split ears into halves on a Petri dish using forceps, and collect the dorsal side (Figure 2). Figure 2. Harvesting of ear sample. A. Harvest ear with scissors and forceps. B. Ear is split into halves using forceps. Transfer the dorsal ear halves into a 24-well plate and fix with 1 ml acetone at -20 °C for 20 min. Remove the acetone and wash 3 times with 1 ml of stain and wash buffer in the 24-well plate at room temperature. Stain the ear halves in a 24-well plate by adding 50 μl of Ly6G PE/Isotype control PE and CD31 APC (1:100 in stain and wash buffer) directly onto the ear halves. Incubate for 1 h at room temperature with shaking. Wash 3 times with 1 ml of stain and wash buffer in the 24-well plate at room temperature. Transfer ear halves onto cover glass. Mount with 10 μl mounting medium containing DAPI (1:1,000) onto glass slides and seal with clear nail polish (Figure 3). Figure 3. Mounting of ear sample onto glass slide. A. Mounting medium is added onto ear halves. B. Ear halves on cover glasses are mounted onto a glass slide. Visualize under confocal microscope. Image under 20x objective, with the HeNe 543 (Cy3) and HeNe633 (Cy5) laser (Figure 4). Figure 4. Immunofluorescence staining of neutrophils in whole-mount ear 3 h after topical application of croton oil. 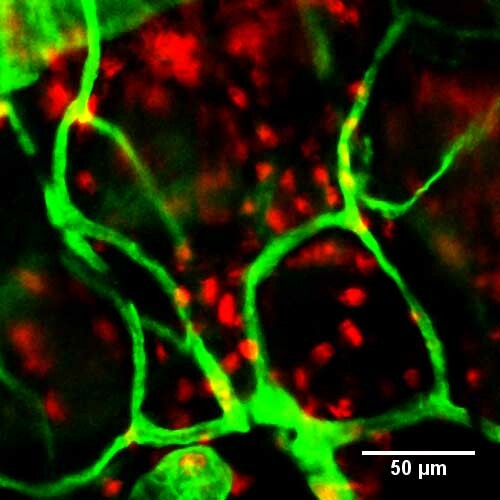 Neutrophils were visualized with anti-Ly6G (red), and blood vessels with anti-CD31 (green). Scale bar, 50 μm. Download ImageJ software from https://imagej.nih.gov/ij/index.html. Export image as TIFF file. Hair removal is important to minimize autofluorescence during imaging. Isotype control ensures specificity of Ly6G staining. This protocol was adapted from the experimental procedures of previously published paper in Gunawan et al. (2015). This work was supported by the National Research Council of Singapore (NMRC/CBRG/0057/2014). Gunawan, M., Venkatesan, N., Loh, J. T., Wong, J. F., Berger, H., Neo, W. H., Li, L. Y., La Win, M. K., Yau, Y. H., Guo, T., See, P. C., Yamazaki, S., Chin, K. C., Gingras, A. R., Shochat, S. G., Ng, L. G., Sze, S. K., Ginhoux, F. and Su, I. H. (2015). The methyltransferase Ezh2 controls cell adhesion and migration through direct methylation of the extranuclear regulatory protein talin. Nat Immunol 16(5): 505-516. Hampton, H. R., Bailey, J., Tomura, M., Brink, R. and Chtanova, T. (2015). Microbe-dependent lymphatic migration of neutrophils modulates lymphocyte proliferation in lymph nodes. Nat Commun 6: 7139. Stock, A. T., Smith, J. M. and Carbone, F. R. (2014). Type I IFN suppresses Cxcr2 driven neutrophil recruitment into the sensory ganglia during viral infection. J Exp Med 211(5): 751-759. How to cite: Loh, J. T., Gunawan, M. and Su, I. (2016). Ear Inflammation and Whole-mount Ear Staining. Bio-protocol 6(20): e1967. DOI: 10.21769/BioProtoc.1967.